I’ve read a lot of Paranormal Romance last year and I have to admit, there aren’t that many good ones out there. It’s really difficult to find the right balance to satisfy me, I’m real picky about my YA book romances. I can count the couples I really enjoyed reading about on one hand. That’s one of the reasons I’ve shied away from the genre this year and turned to the more conventional fantasy. I requested “A Shimmer of Angels” from NetGalley last year and was a bit reluctant to start it, because of the above mentioned reasons. But boy, when I started reading, I couldn’t stop. This book is a lot darker than I expected it to be, it shows a whole other side of the paranormal YA scene. Ray can see wings and it has ruined her life. She’s been sent to a mental hospital three times by her father, but the wings just won’t go away. The doctors tell her she’s schizophrenic and seeing the wings as a coping mechanism to deal with her mother’s death. Ray thinks she’s losing it. Little do they know the wings are real and so are Angels. I was pleasantly surprised by how intimate this book was. The struggle Rayna has to go to, to accept the fact she isn’t crazy and the wings are real feels so genuine, I could really feel the panic and pain described. And although Rayna’s intimate struggle is a bit overwhelming at certain times, it just feels so real and different from all the other things I’ve read so far, I couldn’t stop turning the pages. I really enjoyed the writing, it was very personal and captured Rayna’s troubled teenage mind perfectly. That combined with a spot on pacing made this book a real page-turner. The two secondary characters, Cam and Kade, didn’t really have that much depth, although I had the feeling we got a lot more insight in Kade’s life and nearly nothing about Cam’s. I hope we’ll get to know them a little better in the sequel, because I’m kind of intrigued about the storylines that were hinted at, but didn’t see a conclusion in this book. I’ll have to warn you, there is a little bit of a love-triangle going on here, but it’s not that powerful and it doesn’t really go anywhere, so although I don’t like love-triangles, it didn’t bother me that much. 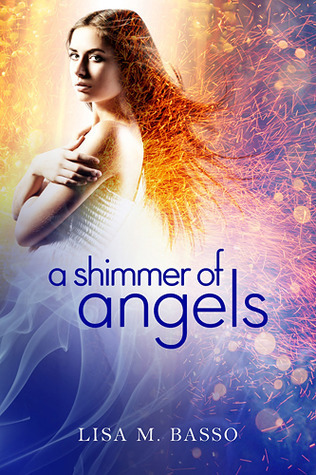 “A Shimmer of Angels” isn’t exactly on par with the brilliant YA books like “Daughter of Smoke and Bone” or Chima’s books, but nevertheless, this is a really powerful debut that deserves a place in the spotlight. Sounds like a book I would love; I miss reading dark YA books.